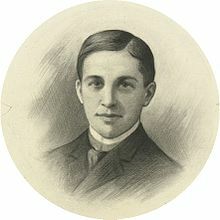 Having written the most famous baseball poem of all time, Casey at the Bat, Ernest Lawrence Thayer (1863 - 1940) would have been a Red Sox fan, having grown up in Lawrence, Massachusetts. He came from a wealthy New England family; his father owned several woolen mills. So of course, he grew up to "spin some yarns" [sorry, reader] after attending Harvard. Then again, he might have been a San Francisco Giants fan after he went to work for classmate William Randolph Hearst at The San Francisco Examiner, writing ballads for the Sunday edition. He sure did hit a grand slam with his immortal baseball verses in 1888.